Personnel – Jeff Swanson: guitar, electronics; Greg Ward: alto sax; Dustin Laurenzi: tenor, OP1; Artie Black: bass clarinet, tenor sax; Quentin Coaxum: trumpet; Paul Bedal: Fender Rhodes; Lane Beckstrom: electric bass; Greg Artry: drums. 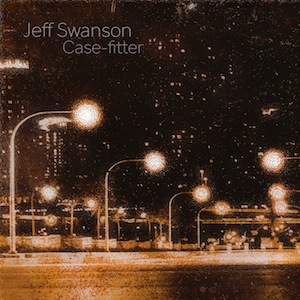 With his debut full-length album, Case-fitter, guitarist/composer Jeff Swanson cultivates the already vibrant Chicago jazz scene with a set of seven plucky compositions. This live recording was a product of a four-week residency at The Whistler in Chicago, in which the bandleader formed a consistent rhythm section with Paul Bedal on Fender Rhodes, Lane Beckstrom on bass, and Greg Artry on drums, and had a valuable frontline of explorers with him: Greg Ward on alto saxophone, Dustin Laurenzi on tenor and OP1, Artie Black on bass clarinet and tenor, and Quentin Coaxum on trumpet. “Graham’s” makes a very good impression, opening the recording with frontal horn manifestations within an affecting pop/rock nature that, having started with a musing posture, gets infectiously bracing over the course of the improvisational section. The first improviser that steps to the forefront is Coaxum, whose translucent melodies are transformed into high flies. Before Ward sets about a juicy narration strategy, we have the tenor explorations of Laurenzi, whose language and timbral appeal cause rhythmic reactions in his peers. Boasting a furiously active horn section, “Two-Nineteen” covers the ground with a full-throttle rhythm and enveloping bass lines. The soloists take distinct approaches, with Ward sounding much more neurotic than Bedal or the bandleader, who crafts his first solo on the record with faded shades of sepia and gray. On the 17-minute “F-Bomb”, a composition propelled by a laid-back rhythmic flux and buoyed by the druggy expressivity of the horns in unison, he is in evidence again, this time through bluesy melodic drives. The tension comes and goes whimsically as the artists extend themselves in individualistic efforts. Swanson and his associates are practitioners of an engaging jazz that may be burning, accessible, and more experimental. The latter case is mirrored on “MF”, a piece containing harmonics, drones, and vocal samples in an incipient electronic haze. The mood is renewed into something more probationary when the trumpeter discourses on top of chromatic bass movements and restless drumming. The rhythm section almost swings by the end, but the experimental procedures with Artry’s turbulent press rolls in the foreground, engulf this intention. This is very contrasting not only with “Little Big Run”, an Afro-funk examination, more in the style of Abdullah Ibrahim than Randy Weston, with a collective romp at the end, but also with “Let The Children Play”, where hard-rock surfaces meet jazz and folkish phrasing. The excitement of playing live sometimes extends the improvisations a little too long. That is a fact that Swanson has to deal with. However, the band enthusiastically channels their waves of passion and driving energy to convey emotions in an ardent way. They were particularly successful in this fundamental aspect.